We started our journey through the World Showcase with the Canada Pavillion. Mik's original goal was to eat his way through the countries, but he ended up giving up eventually because some place like Canada only have sit down places. 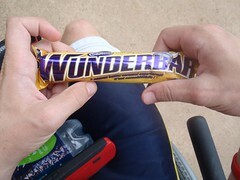 However, in Canada he did decide to get a Wunderbar candy bar from the gift shop. 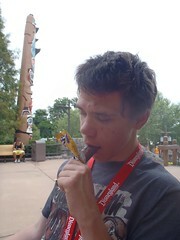 It sounded interesting to him because it is a peanut butter caramel candy bar and he loves peanut butter. He did not really like it, though, because he is not a fan of the stickiness of caramel. We did not spend much time in the Canada Pavillion because the area is pretty small other than the restaurant area. 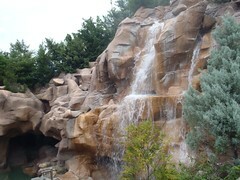 We just went up to the waterfall. 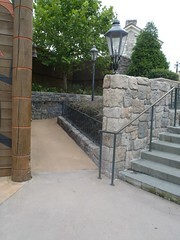 There are ramps to the side of the stairs to get to the shop and then up to the waterfall. However, to get to the movie there are stairs, so you have to go back down and through the restaurant entrance, but Mik did not feel like seeing it.